“The Wisconsin State Register” Portage, Columbia County, Wisconsin Saturday, March 27, 1869. Vol. 9, No. 3, Page 3. “The Wisconsin State Register” Portage, Columbia County, Wisconsin Saturday, Oct. 2, 1875. Vol. 15, No. 31, Page 3. We regret to learn of the death, by typhoid fever at Eau Claire, on Tuesday last, of Miss MARY STALEY, a very accomplished young lady, and daughter of Mr. JONATHAN STALEY, of this city. Miss Staley was visiting in Eau Claire, and had been sick but a short time, and but few of her acquaintances here were aware of her illness. The news of her sudden death was unexpected and is deeply deplored by her numerous friends in this city. She has been a teacher in one of our city schools for a year or two past, and was greatly beloved by both parents and pupils. Her relatives are in the deepest sorrow over the sad event. She was about 20 years of age. The funeral discourse will be delivered by Rev. Mr. McEWEN, on Sunday, at 7 o’clock p.m., at the Baptist Church. “The Madison Daily Leader” Madison, Lake County, South Dakota. Wednesday, Feb. 3, 1897. Page 3. The numerous friends of Mrs. Jonathan Staley of this city will hear with deep regret of her death, this morning, of heart failure, at the family residence in the south part of town. Mrs. Staley was a quiet, unassuming woman of deep religious convictions, of strong friendships and most highly respected by friends and neighbors. Her children loved and respected her and though grown up and widely scattered they honoured and comforted her with many visits. Deceased, whose maiden name was Catharine Laurie, was born at Greenburn, Linlithgowshire, Scotland, February 28, 1826, and was thus nearly 71 years of age. She married in the old country to Jonathan Staley and in 1849 with their three eldest children they emigrated to this country, settling at Fort Winnebago, now Portage, Wis. In 1886 the family removed to LaCrosse, Wis., and two years later came to Madison, S.D., where Mr. Staley died seven years ago. A family of ten children, of whom eight are now living, was the fruit of their union, and the later years of Mrs. Staley’s life has been spent in the home maintained by her and her son Thomas in this city, one or other of her daughters – Jennie or Marion – being with her most of the time. She has been sick for three months and her son William of Chicago has been constantly with her for the past three weeks. The children consist of Mrs. Jennie Roberts, Thomas and Marion C. of Madison, who were also present at the time of her death, Jonathan of Beaver Dam, Wis., Mrs. A. C. Stevens of Minneapolis, Minn., William L. of Chicago and Daniel B. of Mercur, Utah. All are expected here except Daniel, to be present at the funeral which takes place from the Baptist church Friday the 5th. inst., at 2 p.m. Rev, W, A, Taylor of the Baptist church, of which deceased had long been a consistent member, will conduct the services. “Portage Daily Register” Portage, Columbia County, Wisconsin. February 10, 1897. Vol. IX, No. 286, Page 4. Mrs. Jonathan Staley died at her home in Madison, South Dakota Wednesday morning, Feb. 3. Deceased was one of the first settlers of Columbia county , having come to this county with her husband and three children in 1849 and settled in this city. In 1886 the family removed to La Crosse, Wis., and two years later removed to Madison, S.D., where Mr. Staley died seven years ago. Mrs. Staley whose maiden name was Catharine Laurie, was born at Greenburn, Linlithgowshire, Scotland, February 28, 1826, and was thus nearly 71 years of age. She is survived by seven children, Mrs. Jennie Roberts, Thomas and Marion C. of Madison, S. D., Jonathan of Beaver Dam, Mrs. A. L. Stevens, Minneapolis, William L. of Chicago and Daniel B. of Mercur, Utah. Mrs. Staley was a consistent member of the Baptist church and will be remembered by many of the old residents of this city. “The Madison Daily Leader” Madison, Lake County, South Dakota. Wednesday, May 15, 1918. Page 3. 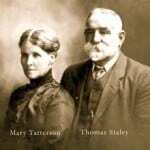 One of the best known Chicago, Milwaukee and St. Paul railway engineers, with headquarters in Madison, Thomas J. Staley, died yesterday at the home of his sister, Mrs, A. C. Stevens, in Minneapolis. Deceased had been ill in bed, suffering from dropsy, since about Christmas time. Tom Staley, as he was familiarly known in Madison, had been in the employ of the Milwaukee company for a period of 52 years, as a waterboy, car wiper, switchman, fireman and locomotive engineer. For the past 32 years he had been an engineer on the S.M. division, most of that time on the Madison and Bristol line. Deceased was born in Fort Winnebago, Columbus county, Wis., August 23, 1852. He was unmarried. A sister, Mrs. Jennie Roberts, Washington avenue S, resides in this city. Among his associate employes Tom Staley was highly respected as a man of strict integrity and also possessed many friends among the citizens of Madison generally with whom he had resided so many years. The remains accompanied by relatives, will arrive in Madison by the north train tomorrow morning, the funeral party proceeding directly from the depot to Graceland cemetery where interment will be made. “The Antigo Daily Journal” Antigo, Langlade County, Wisconsin. Thursday, Dec. 19th., 1929. Page 3. Mrs. Jennie Roberts, 89, died at her home here last night at about 5 o’clock, death resulting from flu and pneumonia. Mrs. Roberts had been a resident of the city for the past 47 years, and was well known here. She was a life-long member of the English Baptist church, and taught Sunday school here for many years. She was born in Scotland, April 5, 1847, and came to the United States when she was three years old with her parents. They first settled in Portage, Wis., and in 1890 moved to Madison. She was married here to John Roberts, who died in 1906. Since then she has made her home alone. She is survived by two sisters, Miss Marion C. Staley and Mrs. Katie Staley, of Minneapolis, and one brother, Dan Staley, Madison. The funeral services will be held Monday afternoon at 2:30 o’clock in the Hallenbeck funeral parlors, with the Rev. C. M. Foreman officiating. Burial will be in Graceland Cemetery. The pallbearers will be Frank C. Fuller, J.C. Palmer, M. A. Bothel, Frank Shippon, Ed Owens and Ben Bast. “The Madison Daily Leader” Madison, Lake County, South Dakota. Tuesday, Jan. 18, 1944, 54th. Year, No. 239, Page 1. William L. Staley Dies at Yankton Rites Here Thursday for Elderly Resident William L. Staley, Madison resident, died yesterday in the state hospital at Yankton, where he had been a patient for the past three years. He was 87 years old and succumbed to the infirmities of old age. Mr. Staley was born on March 24, 1856, in Columbia county, Wis., and was an iron moulder by trade. He worked in several foundries in Chicago, Minneapolis and Wisconsin cities and after coming to South Dakota, he was employed in the Bruns foundry at Watertown and by Pankow Bros. iron works in Sioux Falls. In 1898, Mr, Staley was married in Chicago to Clara Vernis, who died there in 1904. After the death of his wife, he came to South Dakota, in 1906, bringing with him his only son, Daniel Staley, now of Madison, who was then five years old. He entrusted the care of his son to his sister, the late Mrs. Jennie Roberts. Mr. Staley lived in Madison intermittently thereafter, but for the last 10 years or more he made his home here with his son. Besides his son, he leaves three granddaughters and one grandson, children of Mr. and Mrs. Dan Staley, and one sister, Mrs. A. C. Stevens, Lakota, N. D., also several nephews and nieces, including Edwin E. Stevens of Madison. Funeral services will be conducted at Hallenbeck’s funeral home Thursday at 2 p.m. by the Rev. J. C. Stoltenberg, Pastor of Trinity Lutheran church. Burial will be in Graceland cemetery. Pallbearers will be I. L. Cox, Ray Olson, M. A. Bothel, Carl Glatz, Ed Owens and Clarence Spawn. Photocopies of these obituaries were sent to me by Thea in Oklahoma, USA, I’ve transcribed them as faithfully as I could, there are several errors, both factual and typographical, but they are pretty much as originally printed. – Noel Staley.